In these days of blockbuster movies exploding with the latest special effects, it's easy to forget the live blockbuster performances that delighted audiences of the past. A wonderful small exhibition at the RISDMuseum (now through February 22, 2015), Circus, captures the golden age of circuses from 1850-1950, both in America and in Europe. I loved this painting, which was new to me. It's by the French painter James Tissot (1836-1902), who more usually painted lovely, languid ladies in beautiful dresses much like the one Loretta shared yesterday. 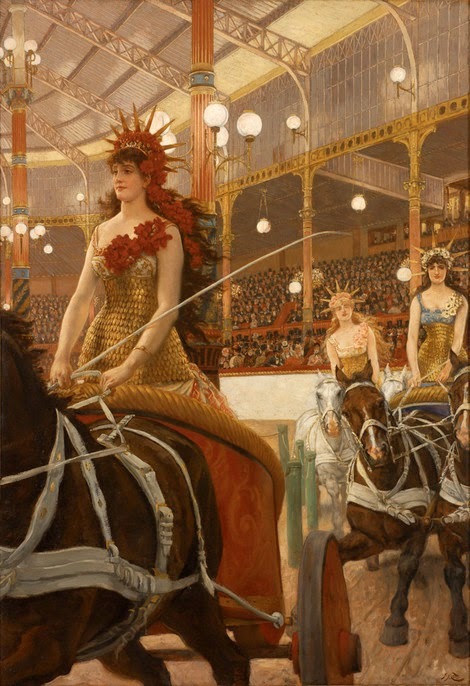 Here, however, Tissot has captured one of the more celebrated circus-style acts of 1880s Paris: Ces Dames des Chars, or the Ladies of the Chariots. The painting shows one of the performances that took place inside the Hippodrome de l'Alma, right, an enormous indoor arena of iron and glass that in itself was an engineering marvel of the time. Built in 1877 at the corner of Avenues Josephine and Alma, the Hippodrome hosted extravagant entertainments with horses and other circus animals, performances that were a combination of circus, rodeo, and music hall. The Hippodrome featured lavish appointments and paintings, and had a glass ceiling with sections that could be opened to the night sky on warm evenings. Shows could include special effects like drifting mists and indoor fireworks, all beneath electric lighting that was still a new-fangled novelty. "Known as Amazons, the charioteers wore costumes of shimmering scales. Their diadems resembled the crown on Frédéric Auguste Bartholdi's new statue, Liberty Illuminating the World, completed in Paris in 1884 and soon to be installed in New York's harbor. Like actresses, dancers, and models, the Amazons belonged to the social class known as the demi-monde, available women whose society enlivened Parisian nightlife." Ces Dames des Chars was an ambitious painting for Tissot. Returning to Paris after living and working in London for eleven years, Tissot had created a grand series of fifteen paintings (including this one) celebrating the modern women of Paris. He had not only planned to use the paintings to re-establish his reputation among French artists, but also to offer prints of the paintings to collectors with matching stories written by prominent authors. But he was unable to interest the writers, and with only a few of the etchings complete, he abandoned the project. Even more discouraging was the reception of the paintings when exhibited. 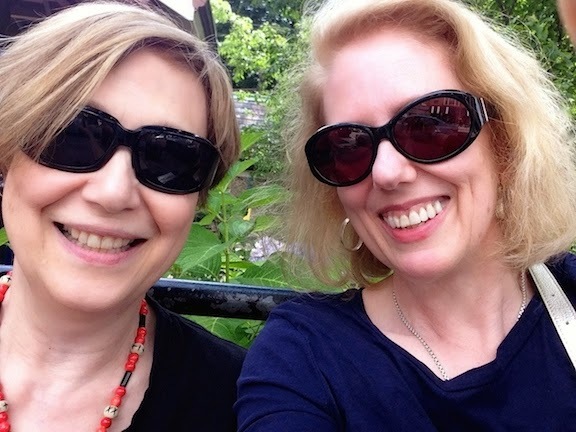 Critics found them awkward and unappealing, and worse yet, complained how all the women appeared to have the same face – which does seem true. When Tissot left London for Paris, he was also mourning the loss of his long-time mistress Kathleen Newton, who had recently died of consumption. Compare these paintings of Mrs. Newton with the Amazons, and the likeness is sadly unmistakable. Upper left: Ces Dames des Chars, by James Tissot, 1883-1885. RISDMuseum. Right: Poster of the Hippodrome de l'Alma, French school, 19th century. Musee de la Ville de Paris. 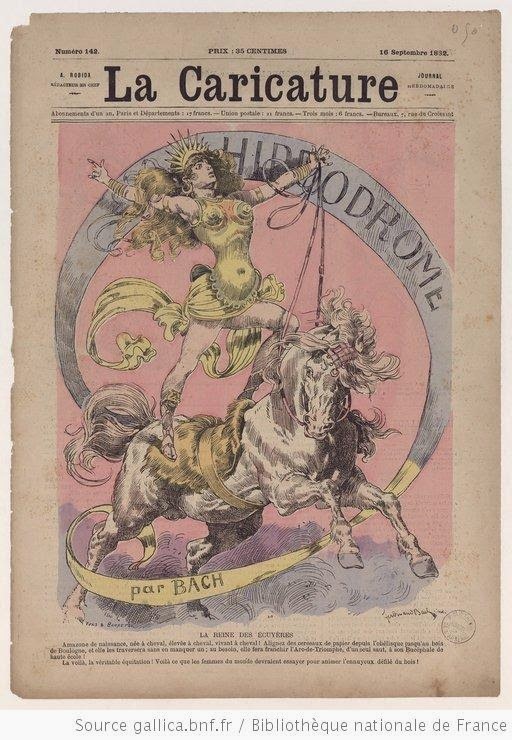 Lower left: Front cover of La Caricature featuring the Hippodrome de l'Alma. Bibliotheque nationale de France. I would never have guessed the painting was by Tissot. Interesting article, in London beautiful women were employed by horse dealers to ride horses in Hyde Park to show them off to potential customers. Many of the women wore the latest fashions as well. They to belonged to the demi-monde, one of the most famous was Catherine Walters known as 'Skittles' who wa an accomplished horsewoman and fashion trend setter. One of the great courtesans of Victorian England. Hmm, I'd forgotten Catherine Walters - she'd make a good future blog post! Thank you for blogging about this painting. I went to see it and it's far more stunning in real life. The subject matter is so unique but provides a fascinating glimpse of a part of life that isn't well known.